Hotel developer and Port of San Diego are still figuring out financing and other details. SAN DIEGO — Just when the final grains of sand deposit into the lower half of the hourglass, someone hits the reset button extending proposed large-scale developments by weeks, months or, in most cases, years. The clock running on RIDA Development’s negotiating period with the Port of San Diego was set to expire Feb. 17 when the latter’s Board of Port Commissioners extended the timeline another 12 months. 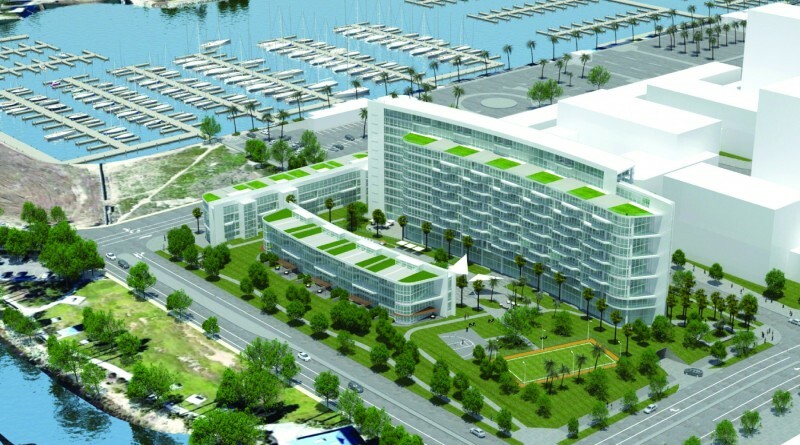 RIDA proposed to bring a convention center and large hotel to the Chula Vista Bayfront. If realized, the large-scale development would substantively alter the Chula Vista Harbor area. Both RIDA and the Port of San Diego now hope to come to an agreement on financing and other project elements by Feb. 16, 2018. Both parties previously hoped to reach some sort of accord by Feb. 17. Commissioners extended the exclusive negotiations period at their Feb. 7 meeting. The port district extended its exclusive negotiating period with RIDA several times after the two parties agreed to discuss the planned development in February 2015. This month’s extension marks the fourth time RIDA and the port district sought additional time to come to terms on the Chula Vista Bayfront development. The negotiation period was previously extended three times in 2016 (February, May and August). “Meetings with RIDA occur monthly to discuss the proposed project terms for the development of the resort and convention center and in December, as part of the ongoing negotiations, RIDA proposed a substantial improvement to the proposed project based on positive signs in the market,” port district staff stated. RIDA originally proposed building a resort hotel with 1,400 to 1,600 rooms near Chula Vista Harbor. Original plans also called for a 400,000-square-foot convention center on the waterfront. In all the convention center and hotel would occupy 36.5 acres on the Chula Vista Waterfront. Redevelopment plans for Chula Vista’s waterfront have been in the works since 2002. Chula Vista’s City Council and the port district approved a redevelopment master plan in 2005. An environmental review was finalized five years later. The port district earned approvals from the California Coastal Commission in 2012. A Request for Qualifications went out to private developers in June 2014; the request sought a developer to build a hotel on the Chula Vista waterfront. Port district commissioners selected RIDA as the project developer in October 2014. Both parties entered into an exclusive negotiating agreement in February 2015. Commissioner Ann Moore, at a December 2015 port district meeting, said the Chula Vista Bayfront redevelopment project could yield 2,000 added jobs and about $1 billion in revenues. The planned RIDA project would be built near Chula Vista Harbor’s two marinas, home to 552 boat slips. Information about the planned Chula Vista Bayfront redevelopment, including who to contact for questions or comments, is available online at portofsandiego.org/chula-vista-bayfront-master-plan.html.